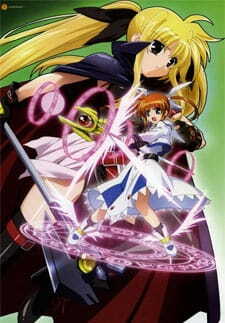 Mahou Shoujo Lyrical Nanoha is one the few magical girl anime that is actually quite decent to watch. Forget about big evil corporations or strategic battles. This is just all about fantasy in a total unrealistic way which makes it enjoyable to watch. What starts of as a childish and girlish anime turns into one 'hell' of a battle in the end. For those who are into magical girl anime then this shall make you 'feel at home' so to speak. For the rest of us, the anime may seem a bit childish and girly at first. The story starts off pretty average with Nanoha accidentally stumbling upon an injured ferret which turns out to be a mage tasked to collect Jewel Seeds in which he had lost throughout the Earth. Of course, Nanoha is confused and weak at first but she slowly gets used to fighting monsters as well as a misunderstood rival that appears later in the series. It pretty much rinse and repeat for nearly every episode. A jewel seed is detected, Nanoha and Yuuno goes and checks it out, monsters then appear and fight monster till it dies. But then, towards the end, something unexpected happens and the story really gets going from there on. If you can bear through the first half of the series you will be glad that you did since the second half gets much better storywise and ends on a cliffhanger which leads to the sequel. The art was decent but not superbly great. I watched it in SD since there wasn't any HD versions available but I can safely say that there won't be much difference either way. The battle animations were rather generic laid out and the monsters were pretty boring. The transformation sequences took forever (which is typical of magical girl animes) and took up a lot of time in the episode. Try watching the last season when multiple mages transform one after another, it seriously takes forever for everyone to finish transforming. Aside from this minor annoyances, my constant thoughts of "why am I watching this girly anime" became "this is slightly getting interesting" as I progressed through the series. Voice acting was brilliant.The characters really sounded like themselves through the whole anime. The opening and ending theme songs were rather standard pop songs which can be enjoyable if you into that type of music. Aside from that, background music was rather repetitive in transformation sequences and fight scenes which I didn't mind too much but some variety would have been nice. At first I was pretty annoyed at how the magical girls in this anime are 13 years old. Seriously, why do 13 year old girls have such massive amounts of power? Well, Nanoha seems a bit too girly at first, but gradually she has a change of heart and actually does fight properly later on in the anime. The rest of the girls pretty much were generic and boring. Sorry, 13 year old magical girls don't really appeal to me that much. Of course, this anime may be intended for the younger girl audience, but certainly, the amount action and dark themes suggests otherwise. Overall, I felt that Mahou Shoujo Lyrical Nanoha leaned more on the cute side than the series side. If you want some decent action and dark themes then check out Mahou Shoujo Madoka Magica. Here is just all about 13 year old girls battling monsters in every episode. However, the sequels get much better and is more suited for older audiences. So if you can bear through this series, I can guarantee that the sequels are definitely much better than this one. Its like "monster of the week" in every episode. Repetitive for a while then slowly becomes more abstract. Decent art style and battle animations. Transformation sequences looked great though. The opening and ending theme songs were rather average. Character's voice acting was brilliant. I'm not that into 13 year old magical girls. The way they speak and think was a bit too childish for me. Rather entertaining for a while then it got a bit repetitive. The story got better in the end though. This is the first step to a much better series. The sequels will definitely be more entertaining.